Milk Producers Owe A Lot Of People Money... Including You? 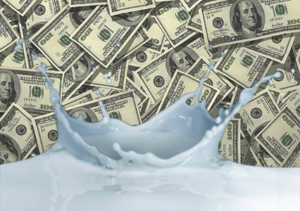 Home » Blog » Milk Producers Owe A Lot Of People Money… Including You? Fortunately, this class action settlement has nothing to do with tainted milk or anything like that. You’re safe, we’re safe, we’re all safe (let’s assume). Unfortunately, the reason countless milk-buyers are getting free money does involve mass slaughter — more than 500,000 cows were killed prematurely in an apparent plot to drive up milk prices. The class action lawsuit, filed by a San Fransisco milk purchaser in 2011, targets the National Milk Producers Federation (NMPF) along with its subsidiary Cooperatives Working Together (CWT). CWT, despite not mentioning milk in their name, consists of various milk producers who together are responsible for 70% of our great nation’s milk supply. Whatever. It’s safe to say we shouldn’t expect an apology from these people, who have “vigorously denied and continue to deny” the cow-slaughter allegations in spite of agreeing to pay millions of dollars for crimes of cow-slaughter. So, this brings us to the next question: who’s eligible? The class action lawsuit applies to milk-buying consumers in fifteen states: Tennessee, Wisconsin, West Virginia, Vermont, South Dakota, Oregon, New Hampshire, Nevada, Nebraska, Missouri, Michigan, Massachusetts, Kansas, California, and Arizona. It also applies to those who lived in Washington D.C. And to be clear, you’re only eligible to receive a portion of the settlement if you’ve lived in one of these states when you bought milk (or milk products). The deadline is fast approaching — if you want to be included, you’ve got to go to boughtmilk.com and file a claim by January, 31. According to the site, qualified individuals will receive $10 to $20 once the settlement is confirmed.